January 26, 2008. Rhino poaching in Kruger National Park. a group of white rhino seen in Kruger National Park, South Africa. I just stumbled over this photo, which i took on this day in 2009 in Kruger National Park, the second year that saw an increased number of rhino poaching incidents in the Park. 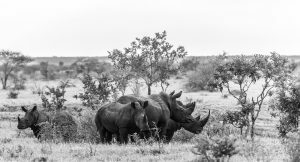 The number of poached Rhinos that year was 50…. If i take the 826 poached Rhinos of 2015, which means 2 poached Rhino every single day. I don´t see an end coming to this, there is to much greed, too much money to be made from a “product” that is worthless. Every single Rhino you see in this Photo is probably dead already. You want to do something about it? Help! Get involved. They need funds. You can help. You can easily donate from basically any country, from South Africa, Kenya, Germany, France, the UK, the United States, Vietnam and China, just name a few. Kruger Park should have a population of appr. 8400 Rhinos today. That might sound like a lot, but at a rate of “only” 2 a day, 8400 Rhinos will be dead in just a bit over 11 years.